It’s a BYOC night at Bangor Abbey tonight. As in, Bring Your Own Cushion. The seating may not offer much in the way of luxury, but the concept is still inviting. It’s the work of Open House Festival in Bangor, Co Down and we’re about to witness Farriers with the Arco String Quartet. So we grab a pew and join in the expectancy with 400 other witnesses. The stained glass is illuminated by the weakening light in August, the faux candles flicker and Farriers begin to enthrall. Last September, the band’s first significant outing with the Arco String Quartet took place in the tiny Picture House at the Ulster Folk And Transport Museum. That was the most special night. 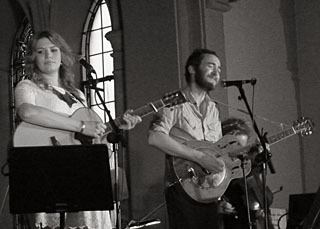 Bluegrass and folk tunes with bonus strings and the singular arrangements of Michael Keeney. And if the early Farriers gigs relied on a Mumford-like stomp, their evolving manner has taken on a delicacy also. Bangor Abbey raises this to another degree. Local boy Stephen Macartney has a keening voice and a bittersweet tone as he sings of juvenile drinking sessions in Ward Park, woozy on Challenger lager and the fleeting sensations of youth. The tunes rebound off the buttresses and Rachel’s voice has the simple authority of a Gillian Welch or an Alison Krauss. ‘Our Greatest Remarks’ is stunning. Stephen leads with a story of damaged lovers, yearning for a tender alternative. Think of ‘Automatic For The People’, the pure heartache and empathy. Yes, really. And if you thought that might be a fluke, they steer us towards ‘This Great Divide’, a letter home from the American Civil War, inspired by Sullivan Ballou’s famous note to his wife Sarah. The song takes us to certain death in Virginia and then rises again, transcendent. Mercy. A few songs have us rolling along two-lane blacktops, far from home. The evening ends with fun, reassurance and many hands clapping. Congratulations to Open House for the best night. Our posteriors may not thank us, but on this occasion, nothing compares to pew.